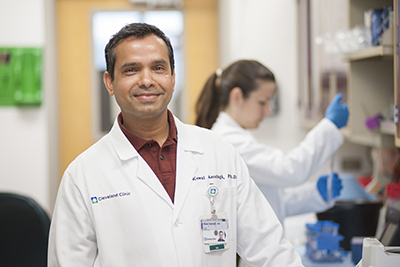 Our laboratory studies the mechanisms that initiate and perpetuate lung inflammation and remodeling, and ultimately lead to lung diseases such as asthma and pulmonary vascular disease. Studies aim to uncover the mechanisms that cause abnormalities in redox balance, signal transduction and/or accelerate arginine metabolism and impact nitric oxide (NO) production. The findings are all being applied to development of diagnostics and therapeutics for patient care. Comhair SA, Erzurum SC. Redox control of asthma: molecular mechanisms and therapeutic opportunities. ANTIOXID REDOX SIGNAL. 2010; 12(1):93-124. PMCID: PMC2824520. Farha S, Laskowski D, George D, Park M, Wilson Tang WH, Dweik R, Erzurum SC. Loss of alveolar membrane diffusing capacity and pulmonary capillary blood volume in pulmonary arterial hypertension. RESP RES. 2013 14:6. PMCID: PMC3560152. Tuder RM, Archer SL, Dorfmüller P, Erzurum SC, Guignabert C, Michelakis E, Rabinovitch M, Schermuly R, Stenmark KR, Morrell NW. [Relevant issues in the pathology and pathobiology of pulmonary hypertension]. TURK KARDIYOL DERN ARS. 2014 Oct;42 Suppl 1:5-16.